Dublin pro Kevin Killeen got his Irish Open festival off to a great start early this morning when he took down the €2k High Roller. The €500k guarantee Main Event starts today with a host of big names expected to compete in Europe’s longest running No Limit poker tournament. Off to Dublin? You can book your accommodation direct with MainEventTravel. Killeen beat Steve Warburton heads-up for the High Roller trophy and €38,585 first prize. Warburton got €25,725 while Jesper Hoog took €19,295 for third place. In all there were 66 entries, generating a €128,620 prize pool. Killeen is used to big scores on home soil; he took down the UKIPT here in 2014 and was runner-up at the 2015 Irish Open for €192,500. His total live tournament winnings are now well over the $800k mark and he’s estimated to have won more than $2m online. The first rounds of the €350 Irish Open Heads Up Championship took place yesterday, with the semi-final and final scheduled for today. 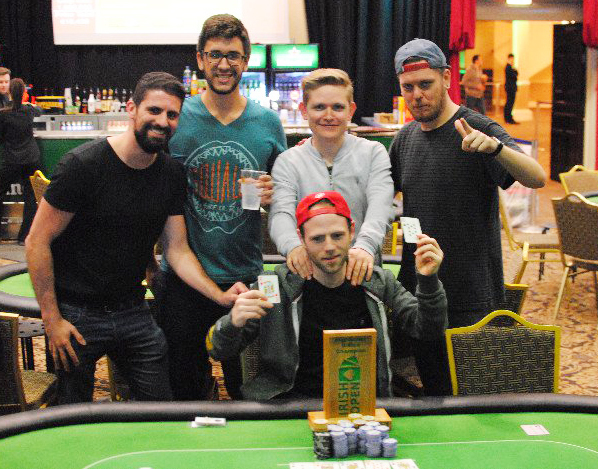 Players who have already tested the waters in side events at CityWest include Ireland’s all time #1 Andy Black, EPT London champ David Vamplew, LAPT runner-up Nicolas Cardyn, November Niner Griffin Benger, UKIPT winner Max Silver, Unibet Ambassador Dara O’Kearney, Peter Eichhardt, Jesper Hoog, Goran Mandic, Kevin Killeen, Steven Warburton, Dean Hutchison, Ben Winsor and Rory Brown.